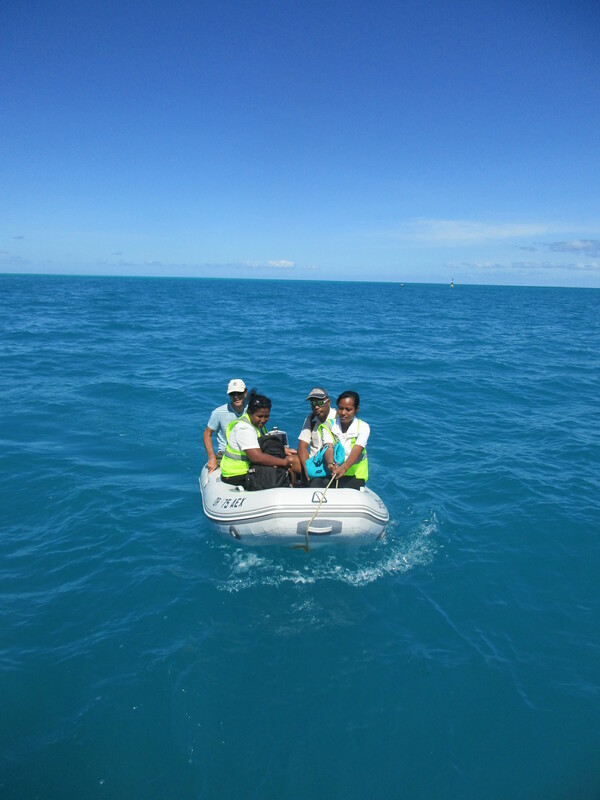 The Health and Quarantine group arriving via dinghy. 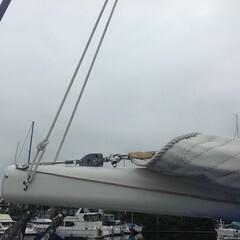 We anchored quite a ways off shore; the ladies weren’t too happy about the wet ride. completing all the forms, signing our signatures that we didn’t have stow-aways, rats, infectious diseases, guns and ammo, no dead arrivals, declared the exact quantity of onions and potatoes, literally, we’re all cleared in. The Quarantine officer then asked for “cold water and snacks, – ‘home made snacks’ . Still recovering from lack of sleep, no fruits and veggies, I brought out iced tea and cookies from Bora Bora. We moved from Betio (Besso) to Ambo, about 5 miles east. We anchored in 10′ of water which wasn’t a problem but when the full moon cycle brought exceptionally low tide we were grounded. The tide came back in and we moved into 15′ depths. A view of the lagoon area from the highway. It’s hot during the day but the breeze blows in the late afternoon into the wee morning hours cooling us down. We’re very happy to have found the laundromat, wash, dry and folded is about $5 – a very cheap price considering water is difficult to make on the boat. Taking a break, waiting for the laundry to be folded. We met a gal at a little open “cafe”, her name is Timera (Simera). 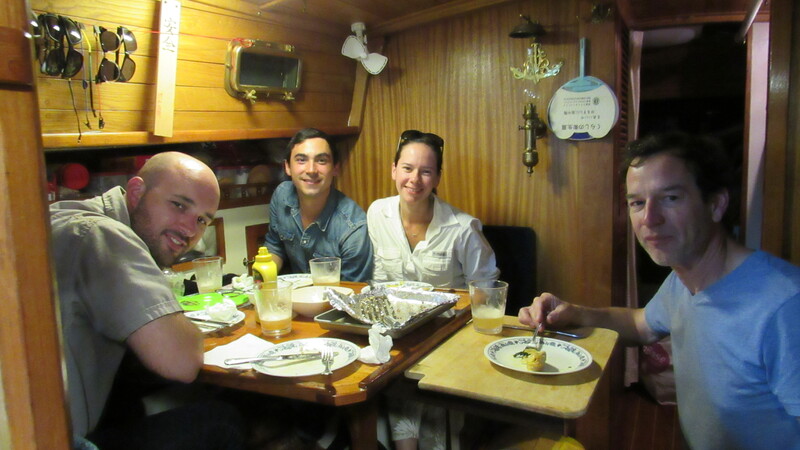 We invited her and her fiancé, Tenabo, to the boat for a lunch. They in turn took us to meet their families in the villages. 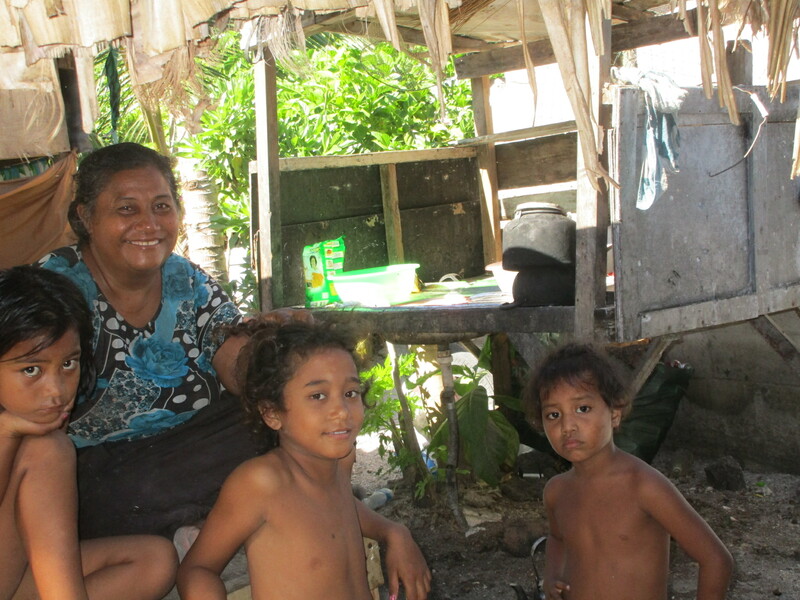 Turned out to be a real eye opening experience in what life is like in Kiribati. 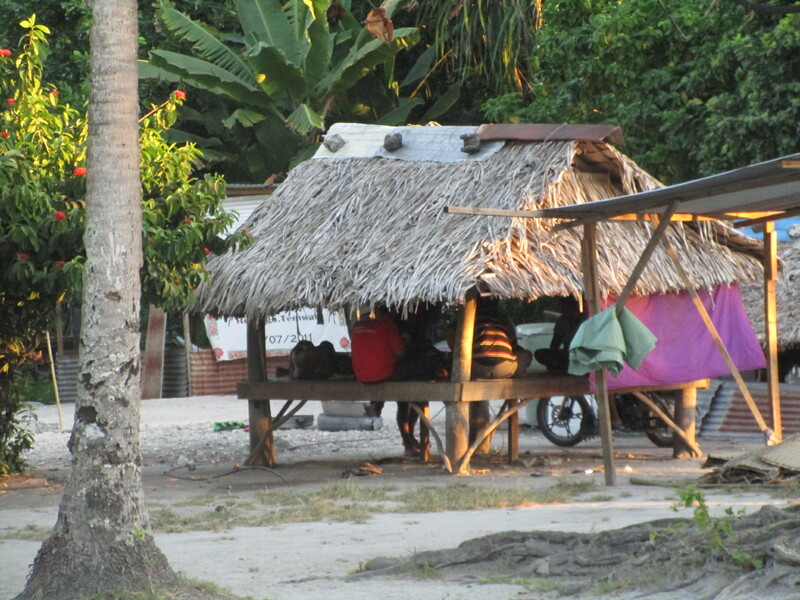 The village homes are no more than 8′ x 10′ galvanized tin structures with thatched roofs, fenced with chicken wire. Most of the homes have a “maneba” a platform raised waist high off the ground where family and guests sit during the day. Some of the homes have fabric draped down for privacy and shade, some are lined with polypropylene rice bags. The interiors are small with nothing more than coral covering the dirt, kerosene stoves, a wash stand as kitchen sink, mats for beds and sitting, solar lights, a community “bathroom”. Pigs, dogs, cats, chickens all roam freely. It’s customary to offer water to guests and we were obliged to drink and visit. 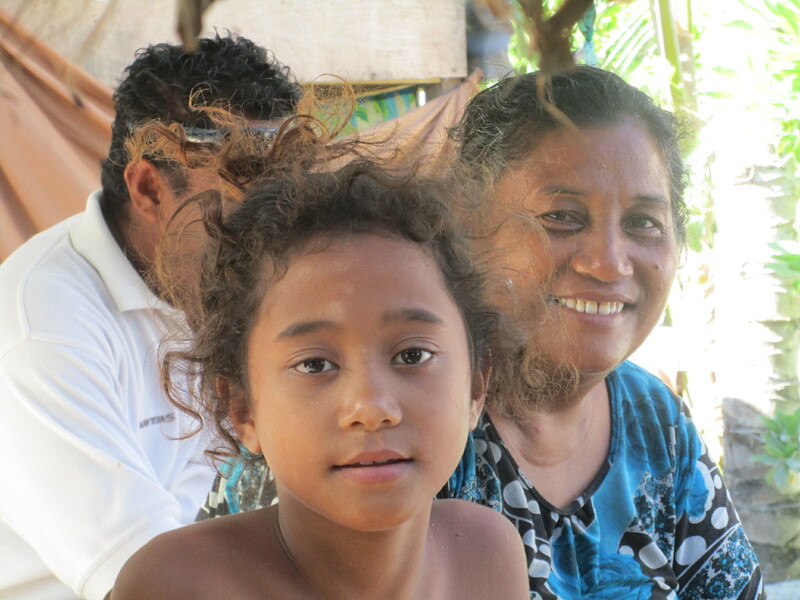 The people are very warm and inviting, wanting to hear all about us and where we come from. We found we didn’t want to elaborate too much about our comfortable lives at home when they have absolutely nothing. We brought our customary gifts of banana bread, jar of jam, candy for the kids. The children want to be held or carried, a little disconcerting when they are naked and not potty trained, but I happily snuggled and played with them. More pictures of our new friends’ families and lifestyle sitting in their maneba. His parents and daughter. 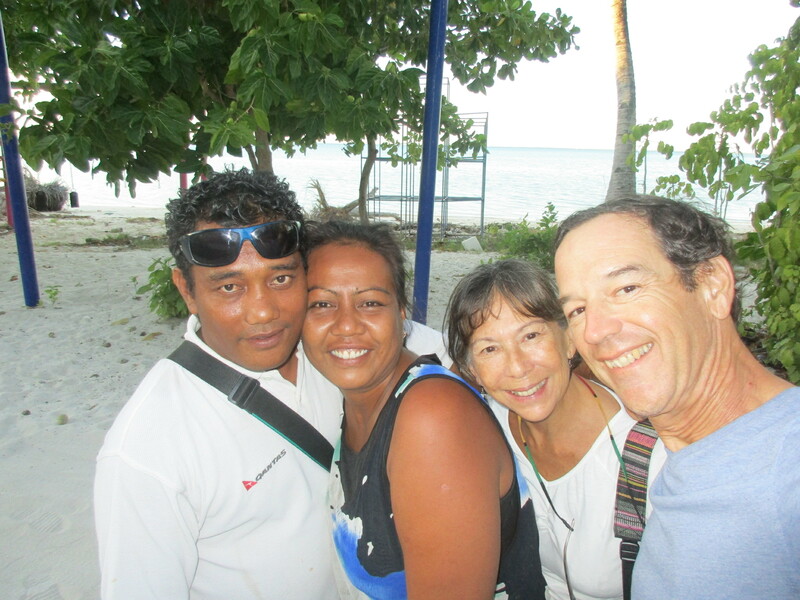 They are from Onotoa, a southern Gilbert island. We were given giant clam meat cured in salt, some fruit “roll up” made from some unknown fruit that was fantastic. This is their “kitchen” wash stand. We are so grateful to have had the opportunity to meet these extraordinary folks and be welcomed into their homes. We’re invited for a family get together later this month. It will be a potluck meal. Not wanting to be rude we’ll attend but I’ll bring paper plates and bamboo eating utensils, and we always carry our in our backpacks. We’ve arranged a tour guide to see all the war relics around the island tomorrow. 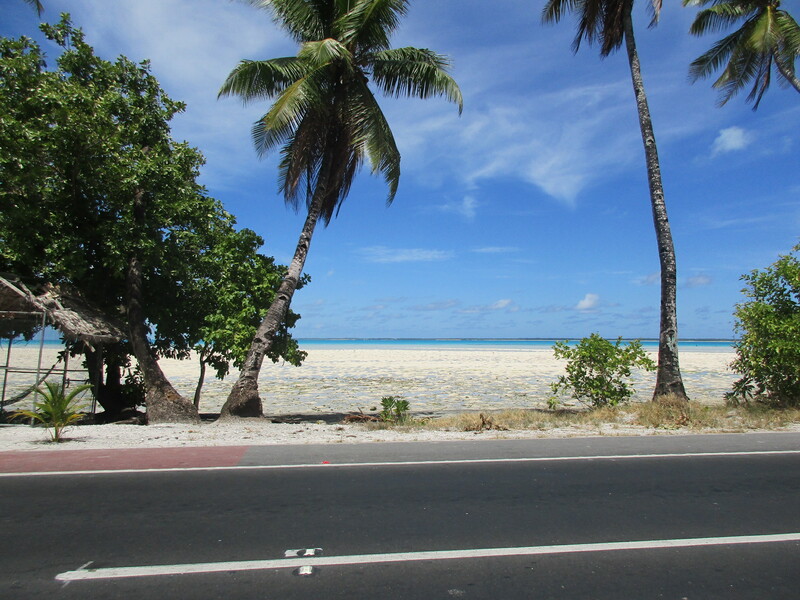 Later this week we’ll be heading off to Abaiang, an outer island 25 miles NE of Tarawa. We will be there for our limited 10 day visit and come back here afterwards. 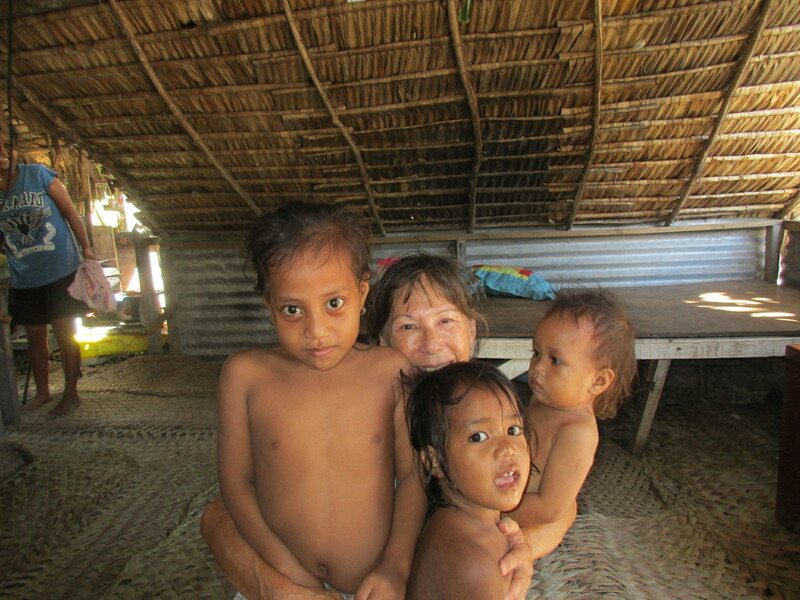 Our new friends are so anxious for us to come back so we can swim, visit their homes and spend more time with them. 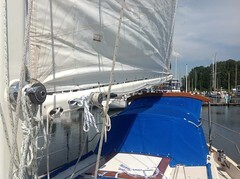 We may bring more of the family out to the boat to have lunch with us. They don’t know what mayonnaise is and eggs being expensive (.70 cents each, much to expensive for their budgets) I will make them special egg salad sandwiches and peanut butter cookies. 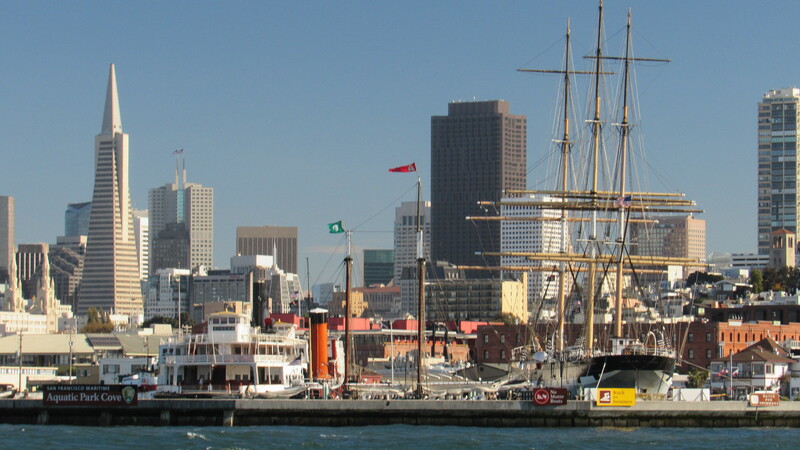 The three weeks we have spent in windy SF blew away with a flurry of events. Between staying with my sister, Theresa and my beautiful niece, nephews, son and fiancée, attending the Westsail rendezvous, we were so entertained we forgot about the working world we left behind. We did the tourist walk through busy downtown during Fleet week, the airshow over the city waterfront was impressive. Massive crowds of people everywhere, we could hardly move walking down the sidewalks and traffic plugged the intersections. It was an “ahhh” moment when we arrived home. 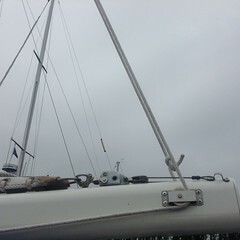 We purchased enough chocolate and wine to stock the boat for about three months, drank a fair amount of nice wine, and appreciated Tess’ yummy breakfasts. The last few days have been filled with offshore boat prep , Mexic0 check-in formalities, downloads of information on fast wifi at Theresa’s home. The best part of last week was the Netflix marathon watching “The Walking Dead” with Theresa! Marathon viewing was decadent- eating dinner in front of the t.v., drinking margaritas and chowing down on ice cream and popcorn. Three blissful evenings doing nothing else. Hilarious! 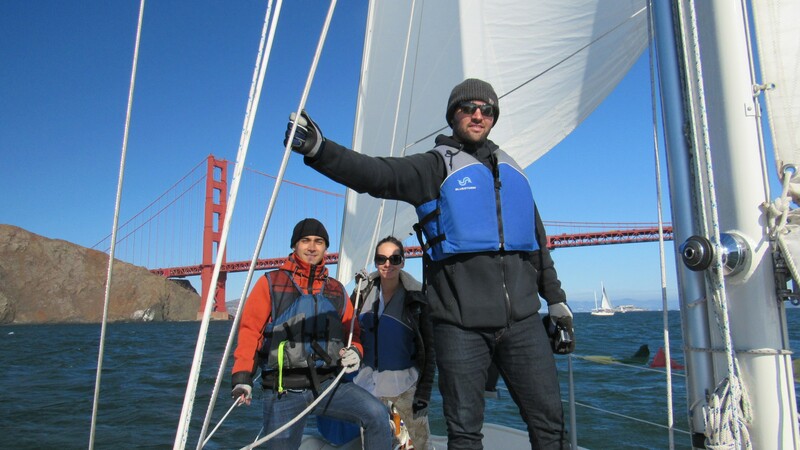 On Friday, we took Tess, her husband, Chase and nephew Tarin for an introductory sailing lesson on the bay. 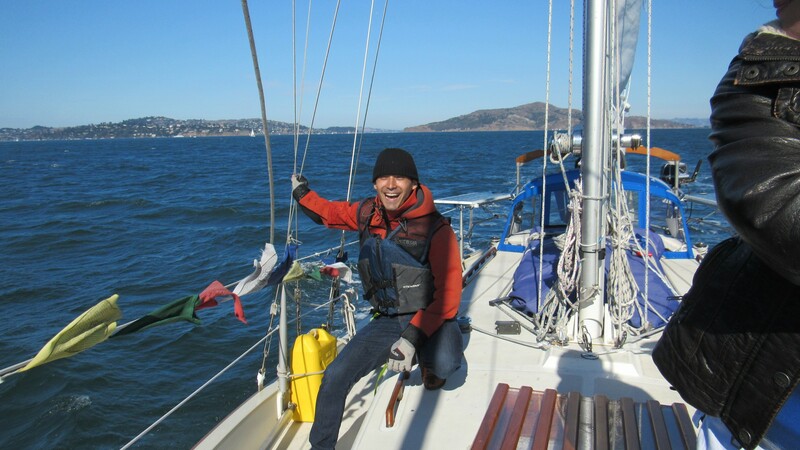 Continued out the Golden Gate to take pictures, sailed along the city waterfront, splashed and rolled over the swells, and ended the day becalmed as we bobbed our way through Raccoon strait. 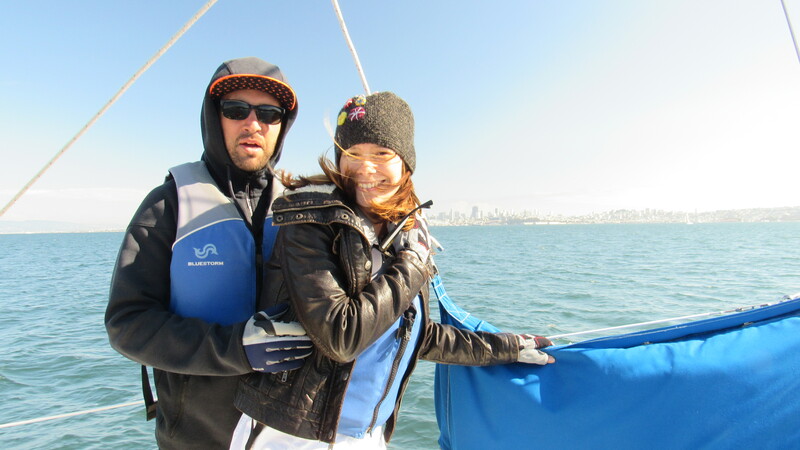 We sailed over four hours showing them the various wind and sail configurations we’ve experienced on the ocean, but for them – all in the bay! 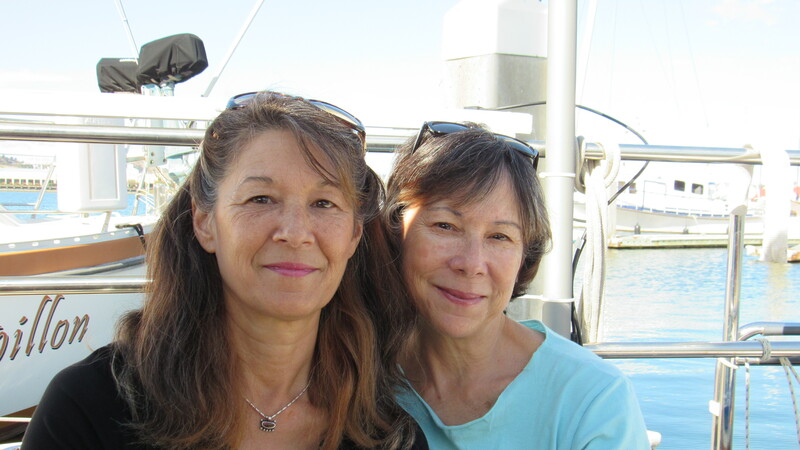 We gave them the chance to pilot the boat. 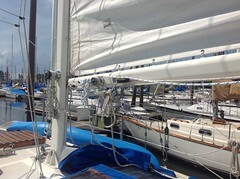 I believe they were a little surprised how much strength it takes to handle the boat and sheet in the sails. I believe Tarin will be a fine sailor one day. He took immediate charge of Konami, a natural born helmsman. He even nailed the “Arghh” and strong arm stance. Tess was impressed with the compact, gimbaling stove and intrigued as it swung back and forth with pans filled with simmering dinner. She would be able to work her fine culinary skills at sea, no problem. The precious time we’ve spent with each family member is so memorable,and I can’t thank them enough for their love and enthusiasm of our adventures. 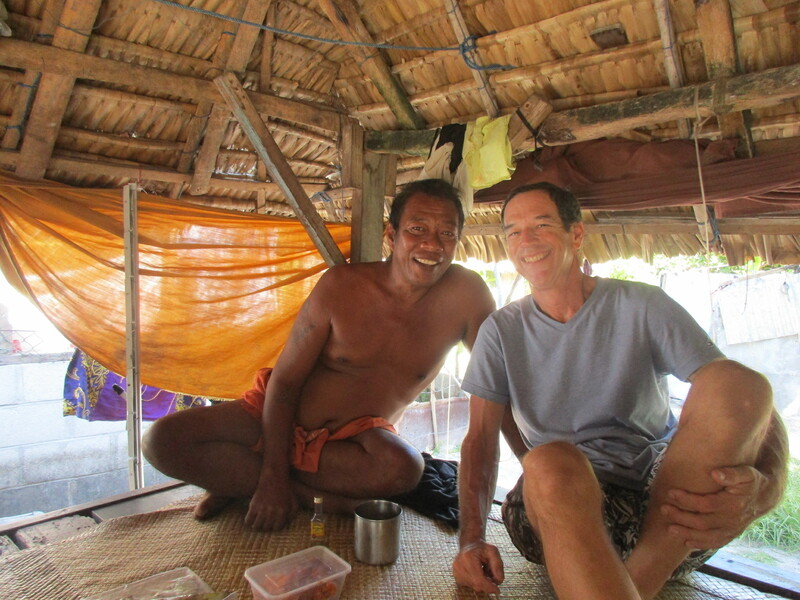 The use of their comfy homes, the vehicle, delicious meals and all the laughter made our stay so rewarding. Theresa, being very wise and strong, gave me piece of mind about all of my doubts. She will be there for my sons and their families during our absence. What a great sister! 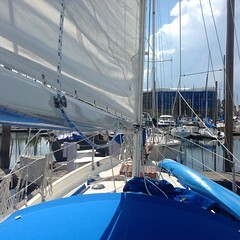 I want to sail away, I want to stay, I’m stepping out of my comfort zone! Theresa reminded me of a Japanese saying: “Our choices rather than our talents, make us who we are”.